Chapter Annual Reports: Due April 30 at 5:00 PM EDT. 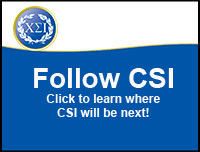 CSI is an international honor society that values academic and professional excellence in counseling. We promote a strong professional identity through members (professional counselors, counselor educators, and students) who contribute to the realization of a healthy society by fostering wellness and human dignity. Our mission is to promote scholarship, research, professionalism, leadership, advocacy, and excellence in counseling, and to recognize high attainment in the pursuit of academic and clinical excellence in the profession of counseling. Founded at Ohio University in 1985, Chi Sigma Iota has over 125,000 members who have been initiated into the Society through more than 400 chapters that have been chartered throughout our history. We are growing by welcoming over 7,000 new members and chartering new chapters each year. Our members are affiliated with campus-based chapters contributing to their counselor education programs and communities. Chapters are supported at least in part by funding from CSI. One of the largest associations of professional counselors in the world, CSI's annual active membership is made up of both professional and student members. Practicing counselors in all settings and specialties of counseling, as well as counselor educators and supervisors, are represented within CSI's professional members. CSI activities occur primarily through our active chapters located in counselor education programs in five regions in the United States and in counselor training programs beyond U.S. borders. Chi Sigma Iota ...We are not just a line on your vita!